It’s a call from the other India that has become ‘foreign’ to our Prime Minister. A sustainably living community has refused to be part of the profit-driven system and is struggling against the mighty state for last 25 years. We must come out and support them. Branding people’s struggles ‘foreign’ and repressing our own people has become the hallmark of this government that is undermining our democracy. Reach Koodankulam on your own. 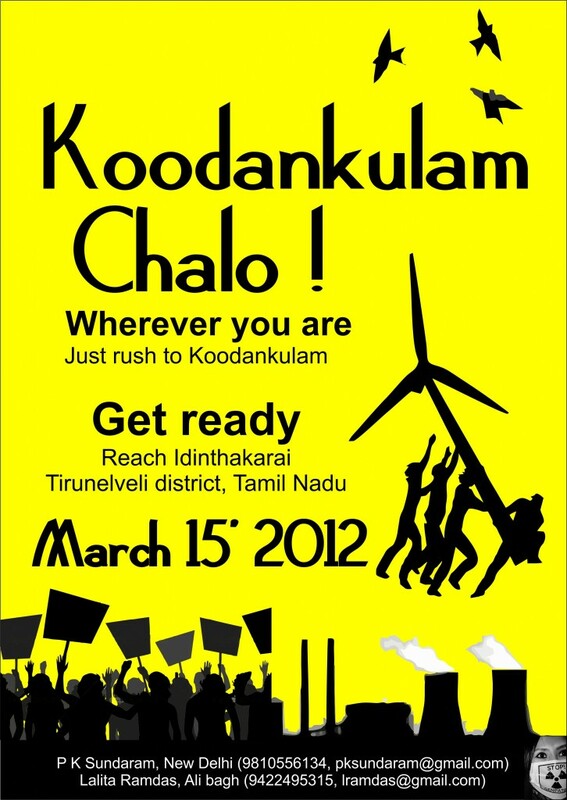 This spontaneous march to Koodankulam is to save our democracy, our people and our ecology. Be part of it. Koodankulam is on of the Village in Radhapuram Taluk , Tirunelveli District , Tamil Nadu State . Koodankulam is located 50.6 km distance from its District Main City Tirunelveli . It is located 602 km distance from its State Main City Chennai . You can reach Kudankulam by flying down to Trivandrum or Madurai, and then driving down to Kudankulam. Since there will be many of us, we can coordinate and take a common vehicle, which we shall arrange. So do let us know where you plan to come, and we will do the coordination. Trivandrum is more well connected by air, so that might be more convenient. Or you can come by train, via Chennai or Bangalore, to Kanyakumari/Nagercoil. Wish I could be a part of this.